At its core, Instrumental Analysis covers the underlying theory, instrumental design, applications, and operation of spectroscopic, electroanalytical, chromatographic, and mass spectral instrumentation. It provides students with the requisite skills to identify the comparative advantages and disadvantages in choosing one analytical technique over another by combining direct comparisons of the techniques with a discussion of how these choices affect the interpretation of the data in its final form. The text is organized into sections that include Spectroscopy & Spectrometry, Separation Science, and Electroanalytical Chemistry. 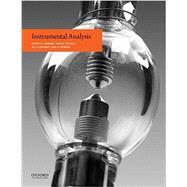 Comprehensive and engaging, Instrumental Analysis provides the most modern coverage of chemical instrumentation. Xenon Arc lamps (sources) produce a broad spectral output from ~ 185 nm to 2000 nm. This is also the approximate spectral range of natural sunlight. Because Xenon sources can be as bright as 33,000 lumens, their relatively high intensity and broad spectral range make them well suited for UV-vis spectroscopy, where low level detection and high spectral resolution are required. This component, along with other sources such as light-emitting diodes (LEDs), is presented in chapter 6 of Instrumental Analysis. Robert M. Granger II is Chair and Professor of Chemistry at Sweet Briar College. Hank M. Yochum is Professor of Physics and Engineering and Director of the Margaret Jones Wyllie '45 Engineering Program at Sweet Briar College. Jill N. Granger is Dean of the Honors College at Western Carolina University. Karl D. Sienerth is Chair and Professor of Chemistry at Elon University.